Windows Phone 8: Gaining Apps, Software Developer Support? When it comes to Windows Phone 8 apps, how many mobile application developers will support Microsoft's forthcoming smartphone operating system upgrade? Survey results from R.W. When it comes to Windows Phone 8 apps, how many mobile application developers will support Microsoft’s forthcoming smartphone operating system upgrade? Survey results from R.W. Baird provide some promising clues, but Microsoft (NASDAQ: MSFT) must climb a steep hill to match Apple iPhone and Google Android developer interest. First, the good news for Windows Phone 8. The R.W. Baird survey covered 200 app writers — most of whom are from North America and Europe. Seventy-one percent of developers say Microsoft’s recent Windows Phone 8 strategy announcement increased their interest in the platform. Sixty-four percent are upbeat about Microsoft Surface, the tablet computer family based on Windows 8 and Windows RT. Two-thirds of respondents say a common code base across Windows Phone 8 (WP8) and Windows 8 for PCs is the most exciting feature of the new OS. Sounds promising. But here’s the challenge. 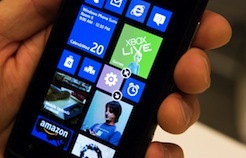 Only 20 percent of those developers currently write mobile apps for Windows Phone 7. In stark contrast, 77 percent of survey participants support Android, and 73 percent support Apple iOS. Oh, and don’t ask about BlackBerry 10 — where developer interest has been plummeting, R.W. Baird indicated. For channel partners, the more important discussion continues to focus on mobile device management (MDM), mobile applications management (MAM), and so-called enterprise app stores that VARs can set up for customers. It seems most MDM discussions in the channel focus purely on Apple iOS and Android. But Microsoft hopes to muscle in on more of the conversation soon — if customers open their arms to Windows Phone 8. Short time ago, a coupple of unreliable reports stated that Lumia was a success in China outselling iPhone. (The story were reported by the usual suspects). Today, Reuters reports that Nokia closes 2 sales offices in China (Shanghai and Chengdu) after a drop from 30.4 % to 11% in the chinese smart phone market (might be the entire mobile market, not the smartmo segment?). Hardly good publicity wrt attacting devs. One app – multiple platforms is certainly a good thing, (for instance, devs upload their Qt code to Nokia and Nokia automagically compiles the code for their platforms.). I would like to see HTML5 being used for apps targeting multiple platforms, but off course – Microsoft has its WP/W twist preventing perfect generic behaviour…. Wow, unless you are being sarcastic, do you have your head in a hole? You could easily replace “China” with “America” and your statement is accurate. Is there any nation in the world that is trendier than the good ol’ U.S. of A.? Even when trying to have a rational debate with someone you get nothing but regurgitated talk show. @Anthoony: US ain’t trendy. We can’t even convert to metric.